Sweet and savory, the Cran-Apple Turkey Sausage is reminiscent of both the holidays and a summer cook out together with loved ones. 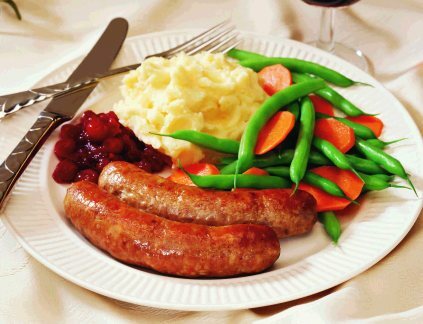 Blended with the perfect combination of herbs, spices and prime cuts of turkey, this sausage will become an instant classic on your table. Uncompromised quality is what your family deserves. This is why we start with natural, free-range prime turkey that is raised without antibiotics or growth hormones. We then artfully blend spices and herbs in-house, to ensure the proper selection of the best ingredients goes into every one of our sausages. At Meaty Meats, innovative products are made in the tradition way were quality and taste are never compromised. Recipes are crafted with a discerning palate, not a formula. Your best interest is kept in mind when producing a product that is nutritious, flavorful and fit for your family. Fillers, artificial flavors or preservatives are never used. That’s the Meaty Meats way.